It’s surprising for me to realize that I was a “normal weight” for the first half of my life. 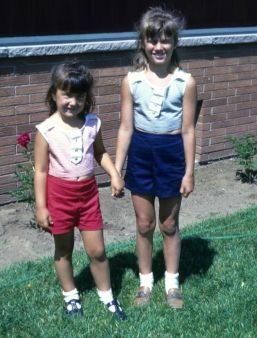 I can see it now in old photos, but I grew up feeling fat and ugly, like so many girls in our culture. For me, it was the messages I got from others, from the media, from comparisons of my body to my smaller sisters. I started dieting young, and developed emotional eating issues that made me feel crazy. And then, I really did get fat. 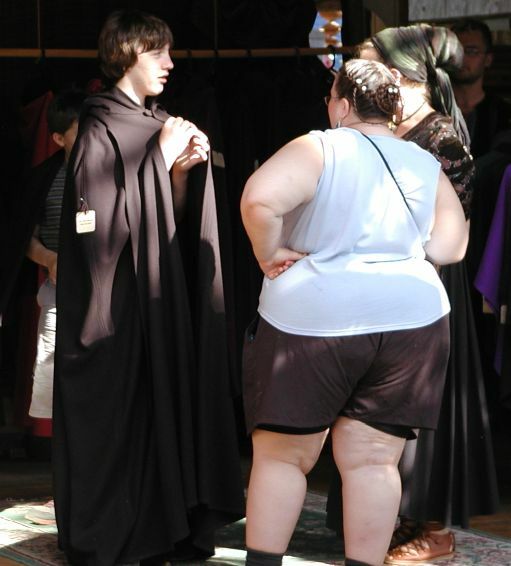 I got married at age 24 weighing 150 lbs (looking pretty but not feeling great), and over the next 15 years gained almost 200 lbs. Yep, kinda unbelievable, even to me. It was a combination of pregnancies, major depression, low self-esteem, issues leftover from my dysfunctional childhood, and big-time emotional eating. I had no clue how to feel my feelings, so I numbed them with food. 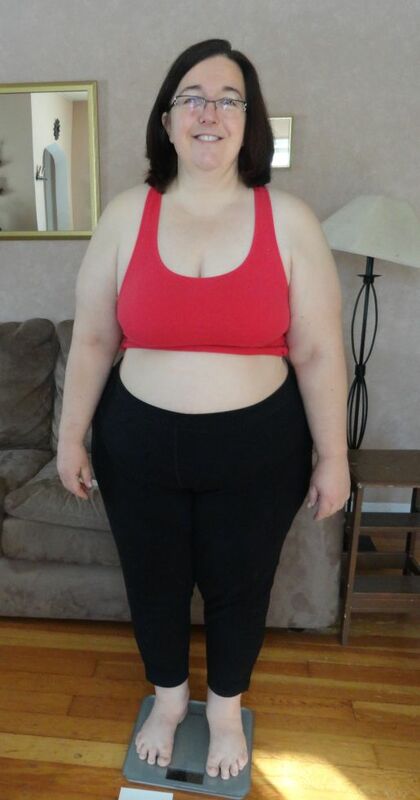 At 348 lbs, I felt horrible physically and emotionally, and limited in what my body could do. I got on an eating plan, lost about 50 lbs and got stuck there. I was exercising a lot, felt better, eating healthier, but still plagued by emotional eating. Decades of therapy had helped, but not quite enough. By January 2013, I hit another rock bottom. 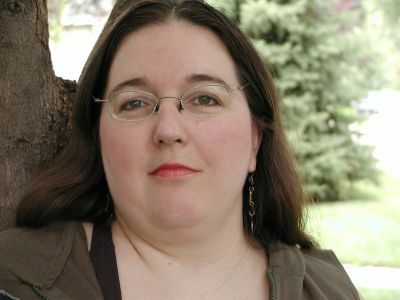 I was still morbidly obese (oh, what lovely words), and my body just couldn’t take it anymore. Over the last 2 years, my daily pain had been increasing—despite exercise, my legs stiffened up and I hobbled, my heels burned, and my knees were constantly sore. Walking hurt. 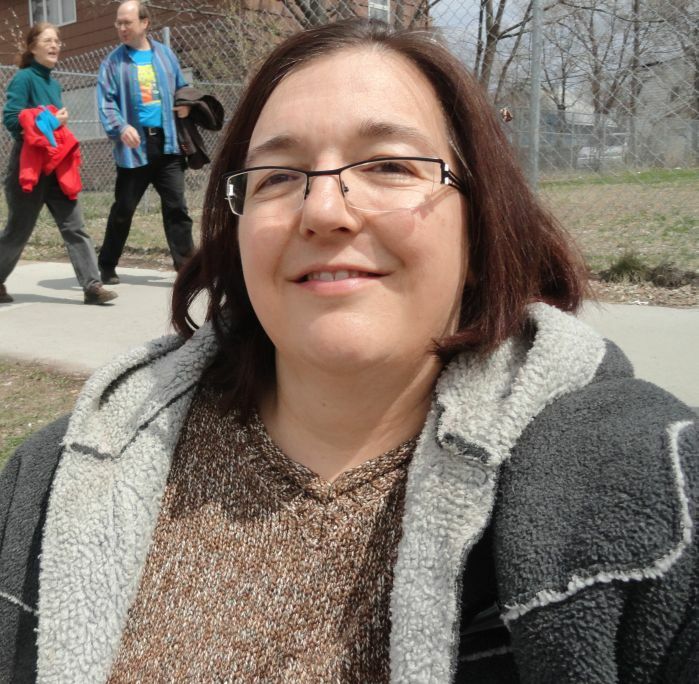 I was increasingly feeling like a disabled person, my life limited in so many ways by my weight. The pain of staying the same was greater than my fear of change… so in January I mustered my wits and courage, and worked to lose weight. I devised my own plan of calorie counting (a moderate amount, not deprivation mode), cutting back on processed carbs, and eating lots more fruits and veggies. And I started losing weight—in fact, I lost 45 lbs in four months. I still had pain, but it was lessening. I was on a roll… and then last week I crashed. I knew from all my reading on eating disorders that diets/deprivation often leads to binges. My routine was off and I was bingeing, days in a row. But, instead of wallowing in shame and beating myself up (old pattern), I wanted to understand what was going on with me. After much processing and watching a few TED talks (so helpful! 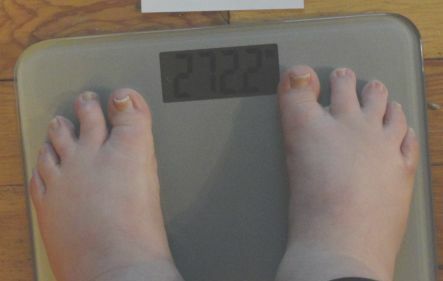 ), I came to see that I’d been SO focused on losing weight that I was off-balance. I was impatient to lose the weight and get it over with, that I wasn’t tending to my whole person—loving where I’m at and who I am right now. I still have about 120 lbs to lose—this is going to take a while. I need to tend to my self-care, even while I work on losing weight. For me, this means: wearing clothes I like, meditating and giving myself space to feel feelings, saying “no” when I need to, gently working on my other issues in life (like anxiety, and clutter), getting enough sleep… and relax about the numbers. I’ll get there when I get there. So, I’m picking up my pack and continuing on this journey, feeling hopeful. My little bump in the road turned out to be a great learning experience. It’s funny to think that in trying to lose half of my body weight, I’m actually gaining more of myself! 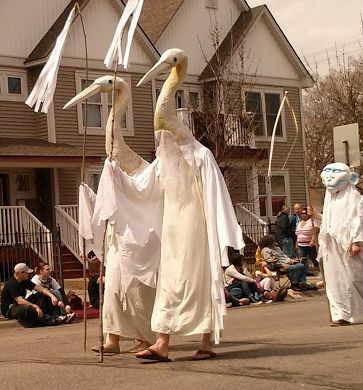 Today was a special day in South Minneapolis– the May Day Parade, an annual tradition for 39 years. 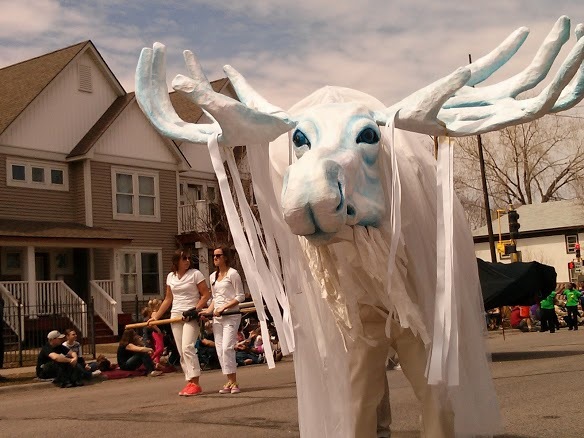 The parade is a favorite— put on by the Heart of the Beast Puppet Theatre, it’s created by talented artists there working with members of the community who want to be a part of the parade. 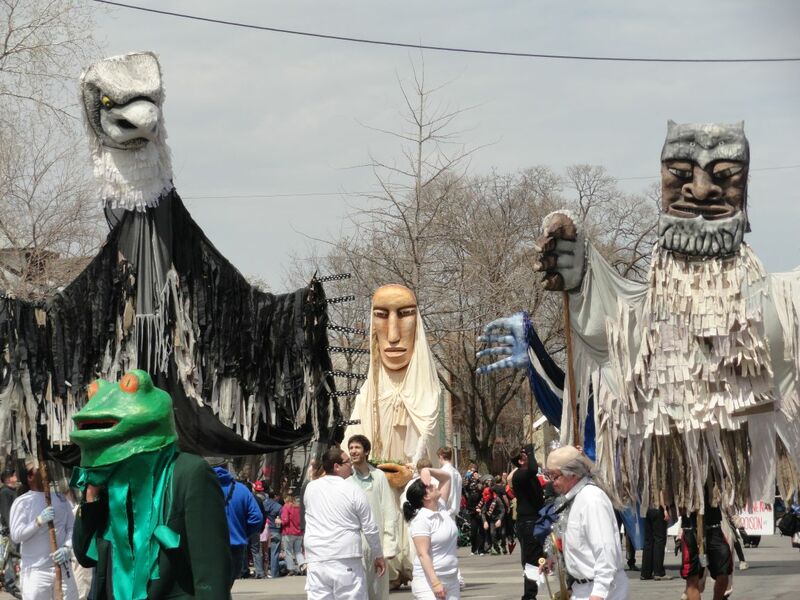 For months ahead of time, people come together to build puppets and costumes out of cardboard, paper mache, cloth and other “junk,” working together on a theme—telling a story of despair, hope and renewal and weaving in social, economic and environmental issues. The result is a festival of color and imagination, playful and joyful. 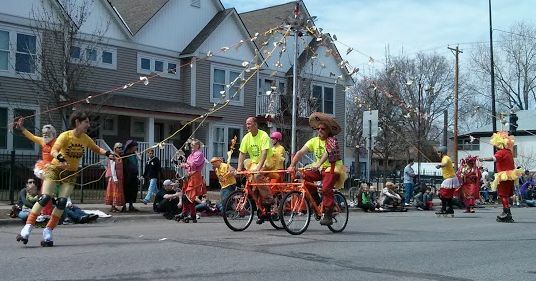 I always feel good about myself and my community when I watch the May Day Parade. Even when I go alone. Which I did this year. It’s really no big deal, but it wasn’t always easy for me, the idea of going certain places ALONE. I remember growing up that going to the movies alone seemed to be taboo. I loved going to movies, and when I moved away to Colorado for a year and lived alone, I found a discount theatre nearby and decided to break that taboo. At first I looked around cautiously, but nobody in the crowd noticed or cared. An older relative had told me she’d never go to a movie alone, that it was too lonely and awkward. That wasn’t my experience at all… I loved being part of the crowd, and getting lost in the story. Still, some events or activities DO seem harder to attend alone. In fact, this parade was one of them for me, once upon a time. 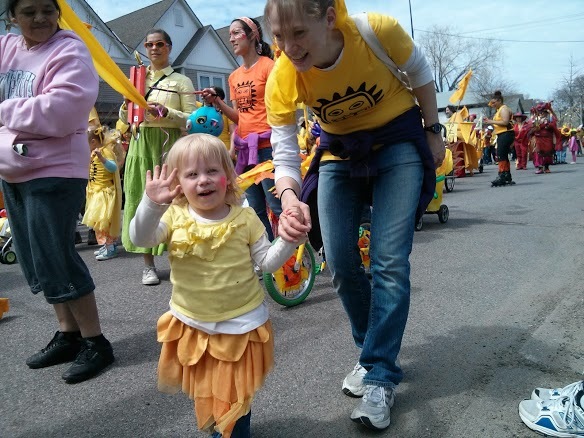 When our kids were growing up, we always attended the May Day Parade as a family… and it was fun to see the delight and amazement on their little faces. Then the kids turned into teenagers, no longer thrilled by a parade. My husband was working full-time and trying to finish his college degree, so he was busy all the time. 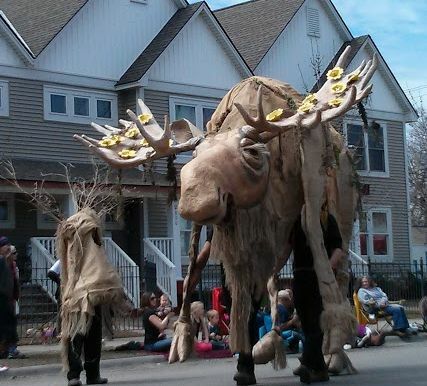 One year I managed to cajole a kid or two to come to the parade with me (I still wanted to go! ), but they weren’t thrilled. It wasn’t their thing anymore. Then came the year NOBODY wanted to go. I’m not proud to say I remember throwing a little tantrum– why couldn’t my family want the same thing I did? I didn’t want the bother of trying to call around and find a friend. I felt frustrated and angry. I hated being in this position: I had to decide to stay home, or go alone. You know, I found myself thinking like my relative—worried that I’d feel lonely and awkward and conspicuous, going to this parade by myself. But going always lifted my spirits, so I decided to do it. And it turned out fine. The parade was still fun to watch, and I found that I’m pretty good company on my own. So I’m challenging myself on thinking outside the comfortable zone, an imaginary box I’ve drawn around events and my expectations about them. Another challenge I’d like to work on is taking the time (and getting past the fear) of inviting others along—that’s a whole ‘nother topic! But for now I can bask in the enjoyment and memories of a fine, sunny and warm May day. In Minnesota, we are having a never-ending winter this year. It’s May 3 and has been snowing off-and-on today… thankfully it’s not sticking, but definitely cold and dreary. We had a taste of the 70s last week, several days of no coats and everyone rushing to be outside, but not this week. We are used to getting some spring-y, balmy days by April, so there are a lot of crabby and complaining folks out there. Radio stations playing Christmas music to make a point! We want our daffodils and sunshine, and we want them now! 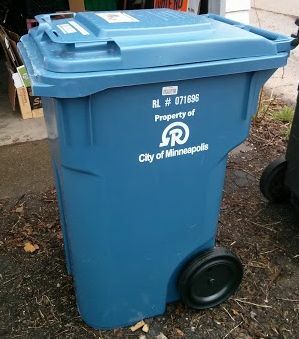 Yes, the neighborhood forums were all excited because we got our new One-Sort Recycling bins! (Hey, we know how to have fun!). Previously, we had squat rectangular bins that we had to sort our recycling into– separate brown paper grocery bags with plastics, glass, metals, newspapers, office papers and flattened cardboard. With the new bin, we just toss everything in, willy-nilly, and the city collects and sorts the recycling. Now, sorting our own recycling wasn’t that big of a deal, but it was a chore I don’t mind giving up. Apparently, the city will create more jobs with this new method, and it will increase the amount of recycling that gets done. How nice to have a win-win situation. 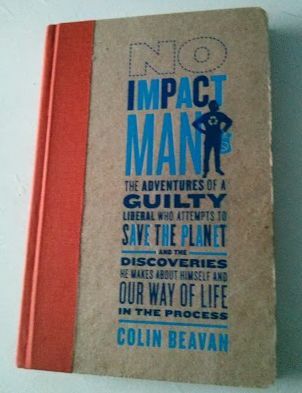 This book chronicles author Colin Beavan’s year of trying to make as little impact on the environment as he could, which he did in 2007 along with his wife and 2-year old daughter. They did this in several stages, increasing in difficulty as they went. They attempted to eat locally (food grown within 250 miles of their New York City apartment), make no trash, use no carbon-based forms of transportation (no elevators, cars, subways, planes or trains, which meant walking and biking), throw out their TV, buy nothing new, and even use no electricity for part of the year– a tricky feat in the heart of the city! The book covers the trials and tribulations of that year, and most importantly, attempts to explore the question: does the way we are living now as Americans actually make us happier? And if the answer is no, then what would make us happier? How would we live if that was our goal? I discovered Colin Beavan back in 2007, when he was living that year and blogging about it. While I’m not an extremist, a lot of what he talks about appeals to me. I don’t like the way our country uses so many resources, I’m afraid about the future, I worry about our health as humans on this planet. I’m willing to explore and make changes. I appreciate that he did this project and explored these issues… the more we learn and question and become aware, the better things will get. So I believe. An entertaining documentary was made about the Beavan family during their year– No Impact Man. A fun watch, currently on Netflix. A lot of people still poo-poo the idea of making any of these kinds of changes. 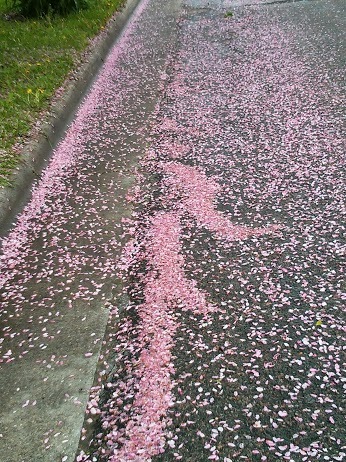 Global warming is still a concept that some choose to deny (“snowing in May… that’s not global WARMING, right?”). But I like Beavan’s underlying question– if living this high-consumer lifestyle isn’t actually making us happy, then what would? It’s a question worth exploring.